Worcester’s fight for a railway and its consequences for the urban, commercial and industrial development of the city in the early Victorian period. In 1800 Worcester was a city with an assured position as a cultural and commercial centre. Situated in a prime location on the River Severn, the city was yet to reach its peak although it was immanent. Thirty years later, Worcester’s growth was slowing and rivals such as Gloucester downstream seemed certain to be get the best of the new technology making its debut – the railway. During the Georgian period, Worcester was the cultural centre of its county and beyond, especially in the period after the Napoleonic Wars. As the county capital, it was a magnet for the middle and upper classes and it provided a range of professional, economic and cultural services; J Britton in his publication, ‘Beauties of England and Wales’ in 1814 proclaimed Worcester ‘the most polished city in this part of the Empire insomuch, that many considerable families from the neighbouring counties and also from Wales, have made it their Winter residence’ (Britton, p.135). The neat appearance of Worcester came from investment by the upper classes of provincial society in the West Midlands in both housing and social activities – activities likely to appeal to polite society - concerts, coffee houses, lectures, theatres, exhibitions, bowling greens, drawing schools and dancing academies. By comparison, its ‘Three Choirs Festival’ partners in Gloucester and Hereford were seen as culturally lacking. By the mid century, ‘the sparkle of its season had passed elsewhere’ (Whitehead, p. 46), and Worcester was replaced by Malvern and Cheltenham. However Worcester had other attributes. William Cobbett in 1826 praised it as ‘one of the cleanest, neatest, handsomest towns I ever saw……Everything you see gives you the idea of real, solid wealth’ (Cobbett, p.179). This wealth came from its position at the centre of a rich agricultural area and its activities in the marketing of livestock and hops. Worcester’s major industry was glovemaking, along with leather processing. There was also the Royal Worcester Porcelain Factory, started in the 1750s in an attempt to replace the clothing trade which had been largely lost to Gloucestershire and Somerset; all the factory’s resources, such as china clay, had to be imported by river. Iron-working supported a fledgling industrial base from 1814, also reliant upon water-borne transport. As David Whitehead points out, ‘there can be little doubt that the principle agent of prosperity for Worcester was the River Severn and that the city shared the growing industrialisation of Birmingham, the Black Country and south Shropshire’ (Whitehead, p.4). Until 1840, Worcester was at the head of the tidal section of the River Severn. and thus an important trans-shipment point. The Severn was well-used and its greatest traffic was in coal. It also carried iron from the furnaces of the Forest of Dean and iron ore transhipped at Bristol. These were sent up-river to the foundries of Shropshire and Worcester and down-river Worcester forwarded salt from Droitwich. The city’s boatmen were heavily involved in these trades. The relatively cheap river transport cut the cost of supplying building materials, which contributed to Worcester’s Georgian appearance. The city invested heavily in the river quays and this in turn attracted industry, including a distillery, soap works, sail and rope manufactories and shot foundries. The canal age also benefited Worcester although direct connection was, like the railway, a long time coming. The first canal to affect the city was the Staffordshire and Worcestershire, (S&WC), joining the Severn upstream at Stourport in 1770 and contributing to the volume of traffic needing transhipment at Worcester. Begun in 1791, the long awaited opening of the Worcester and Birmingham Canal (W&BC) occurred in 1815; Its construction had met severe opposition from landowners but, unsurprisingly, none from Worcester. Entering the Severn just below the city it also encouraged transhipment and more importantly, industrial growth, utilising two relatively underdeveloped areas, east of the city around Lowesmoor and at the mouth of the canal at Diglis. New industries like brick making, vinegar manufacturing and gas production appeared along its banks as well as expansion in iron and metal foundries. Warehouses were built and the commercial focus in Worcester began to shift east. The coming of the canal corresponded with the city’s period of maximum growth. The Severn was a constant source of problems and improvement schemes were regularly put forward. The drawback was that the river was an ancient right-of-way, the ‘King’s High Stream of Severn’ and so passage on it was free of tolls; there was no financial incentive for investment in improvements such as locks and weirs. Watermen were at the whim of tide and water-level and this caused major delays in the summer. This lack of reliable transport was no doubt a key issue in the minds of those seeking railway connection. Traffic on the Severn increased substantially in 1827 following the opening of the Gloucester and Berkeley Ship Canal. Technological improvements included the use of steam towing. However this did not overcome the problems of poor water levels. An added spur to improvement is mentioned by Henry J Marten in his report to the Severn Commissioners in 1892. He noted that ‘ in the year 1835, when a Railway having been projected from Gloucester to Birmingham, avoiding Worcester, the importance of a more perfect water communication was again discussed’ . In 1836, the proposed Severn Navigation Company bill advocated a locking system between Gloucester and Stourport, allowing seagoing craft to reach Worcester. The merchants of Worcester were in favour, seeing themselves replacing Gloucester as the head port. Opposition came from rival towns. Stourport feared that the proposed toll would endanger their Staffordshire coal trade, and thought that big craft should pay a higher toll than small – ‘If the Worcester traders want a Ship Canal, they ought to pay a higher rate of Tonnage on Ships, and not tax Stourport whose Traders cannot have any advantage from a Ship Canal’ (Hadfield, p.119). The rivalry between Gloucester and Worcester led Gloucester merchants to seek a restriction to barge depth up-river so preserving their transhipment trade. The various bodies combined to defeat the Navigation's bill in April 1837 and again the following year. In 1800, the principle employers were Worcester Royal Porcelain, Fownes Gloves, and Three Springs Tannery, By 1815, another porcelain manufacturer, Grainger’s, had appeared along with Hardy & Padmore, Iron Founders. The arrival of the canal initiated a burst of industrial growth. After 1815 businesses such as Thomas & Son, Wind Pumps; Elt’s Footwear; Hill Evans, Vinegar works; Larkworthy’s Agricultural Machinery; Russell & Dorrell, Workers Clothing; Dent Allcroft, Gloves; Nicholson & Sons, Organ Builders; Chamberlain’s Porcelain; Willis’s Cinderella Shoe Factory and the Vulcan Iron Foundry were all started, the majority in Lowesmoor. Industrial development continued throughout the years of debate over railway connection. Webb’s Horsehair Carpet Factory which started in 1835 rapidly expanded until, by the 1850s, one of their special lines was horsehair carpet foot rugs for the OW&WR and other railways in Britain. Hill Evans Vinegar works of 1830 grew to become the largest in the world. McNaught’s Carriage Works became one of the most famous of 19th century coachbuilders. In 1837, Lea & Perrin’s began production of its famous Worcestershire Sauce. For none of these industries did the absence of a railway seem a problem although, in later years, firms like Hill Evans had their own private connection. Indeed Joseph Bentley, in 1840, felt that ‘Few places suffer less from the ebbings and flowings of trade than Worcester; being considerably engaged in producing articles of general use for the home market’ (Bentley p.56). Despite the desired rail connection, most of these industries managed to survive and grow during the period prior to the railway’s arrival in 1852, probably because many of them had agricultural connections. However the glove trade went into steep decline following the lifting of a trade barrier against foreign imports in 1826 and the porcelain business also went into recession. However it is doubtful whether railway communication would have helped as these trades were governed essentially by the whims of politics and fashion. As the railway age dawned Worcester was benefiting from the growth of industry in Britain, through its position as a transport centre and through its own industrial activities. Dark clouds gathered on the horizon with the publication of the Birmingham & Gloucester Railway (B&GR) bill on September 23rd 1835. The original scheme had been put before the people of Worcester at a public meeting on January 15th, 1834. Two routes were suggested, one via Stourbridge, Kidderminster and Worcester, and the other, as built, direct from Birmingham to Gloucester. The result of the meeting was a resolution ‘to approve of no railway but one which came right through Worcester’ (Turberville, p.151). The publication of the bill had little initial impact at the time and the apathy of the people was slated in the Worcester Journal in the weeks following – there was ‘scarcely any indication that the inhabitants of Worcester took much interest in the matter’ . A meeting with a B&GR representative on October 15th 1835 was a civilised affair. The route was discussed and the railway’s chief excuse for avoiding Worcester was revealed, that it was ‘in consequence of the bad levels near Worcester, the nearest point of approach is a little beyond Spetchley Park’ - this was about three and a half miles from the city centre; it was to become a journey by horse omnibus - ‘fifteen people huddled aboard for the best part of an hour of tedious jolting’ (Gwilliam, p.57). As a sop, the B&GR offered a branch line, provided that the citizens of Worcester could find the £60,000 needed – if so, there was ‘no doubt the Company would undertake a branch to Worcester’ . This reassurance seems to have swayed the meeting and the paper urged that ‘We do hope that our fellow-citizens will weigh the disadvantages which must accrue to the city if they miss this opportunity........We strongly feel that if the line passes without touching us, the interests of the city will suffer not lightly’ . It is doubtful if the railway company ever intended to serve Worcester. The company was formed by prominent individuals in Birmingham and, to a lesser extent, Gloucester. They wanted to use the new technology to improve the speed and reliability with which they could export their wares and import their raw materials. Diversions caused extra expense. The Worcester Journal’s statement was a realistic approach, aware of the need not to be left out of any scheme that would allow the city its railway. The Journal’s policy of appeasement did not take root. By October 29th opposition had mobilised and one of the main protagonists, Matthew Pierpoint, entered the fray. Pierpoint was a ‘strange turbulent character’ (Gwilliam, p.117) who almost single-handed took on the B&GR. The meeting could not disguise its distrust of the B&GR, nor refrain from expressing its surprise that a railway was projected and its shares almost paid up without an appeal to the city or county through which thirty five miles of its route passed; it was also surprised that a city of 30,000 inhabitants could mean so little to the line’s promoters. Dire warnings came from a Mr Williams, citing the case of Warrington, now on a branch of the Liverpool & Manchester Railway, a town which before the opening of the line had been a flourishing one and which ‘ from being in a state of prosperity, it had now become a deserted village’ . The meeting ending with the adoption of a resolution ‘sensible of the great importance of not allowing a rail-road to be carried from Gloucester to Birmingham, without a due attention to the interests of this populous manufacturing city, determines to sanction no rail-road that does not bring the main line close to or within a mile of the city of Worcester’ . The Journal was adamant, ‘our native city may obtain all the benefits which the best-designed rail-road can communicate to it. Her welfare will ever hold in our estimation a place paramount to every other object’ . What becomes clear from the above is that the driving force here is not the technology, but civic passion, no doubt well underpinned with self-interest – the members of the committees formed after these meetings were well sprinkled with local industrialists and employers. In fact the technology is rarely mentioned - it appears that the social implications for the position of their city relative to those around overrode all. The battle rumbled on for several years. In 1839 the city opposed an attempt by the B&GR to bring in a bill extending their line to the Gloucester & Berkeley Canal, on the grounds that they had not fulfilled their engagements to Worcester; in 1842 the B&GR was threatened with proceedings and it offered to construct the branch only to meet land-owner opposition. In 1843 the B&GR again sought to build a branch, this time from Bredicot to Worcester but this also fell because of land-owner opposition and also opposition from the city – eight years on, the fight continued for the direct line. The Grand Connection Railway (GCR) of 1835 was essentially Pierpoint’s project and his attempt to force the hand of the B&GR; it specified a line from Gloucester to Worcester by the west side of the Severn, crossing over to serve Kidderminster and thence Birmingham and Wolverhampton. It was, unlike the B&GR, essentially a Worcestershire project which makes it ironic that, despite early Parliamentary success, it was thrown out in March 1837 on the grounds that ‘it would destroy the beauty of the county of Worcester’ (Turberville, p.155). In reality it was defeated by the land-owners. Worcester was left to battle the B&GR and grasp at any other railway that headed their way; of these there were plenty. This was the beginning of the Railway Mania and by 1845 over 40 railway schemes had been projected in Worcestershire, 13 of which affected the city; only 6 received legal sanction. The one that most served the interests of the city was the Oxford, Worcester and Wolverhampton Railway (OW&WR) but it was also not sanctioned without a fight. On March 19th, 1844, a gathering of tradesmen in Worcester, were asked to support a line from Oxford through Worcester to Wolverhampton, a line backed by the Great Western Railway (GWR). Despite efforts by GCR shareholders to keep their line in play, the meeting backed the OW&WR almost unanimously. Further meetings introduced another competitor; a line from Tring in Hertfordshire, backed by the London & Birmingham Railway (L&BR). Worcester continued to back the OW&WR. Unfortunately for Worcester, rival track systems led to the county being at the centre of the dispute known as the ‘Battle of the Gauges’. The OW&WR, was to be constructed in ‘broad gauge’, 7’ 0", the Tring line in ‘narrow’, 4’ 8 ½ ". Up to 1845, the broad gauge had made little progress above Gloucester and control of the Severn Valley was seen as critical. It proved a long & costly battle. However following packed public meetings in Worcester, the broad gauge champions won the Parliamentary battle, largely through the evidence of Worcester witnesses. The OW&WR Act of 4th August 1845 was chosen against the L&BR’s Tring to Worcester line because Parliament had a suspicion that the L&BR would not actually build their line – theirs was a blocking manoeuvre. This expensive beginning, coupled with an underestimate of costs of 2 ½ times had repercussions and led to delay in fulfilling Worcester’s dream; the building of the OW&WR was a struggle hampered by financial difficulties. A letter from the Commissioner for Railways on December 15th 1849 responded to ‘the several memorials that have been presented to the Board complaining of the inconvenience sustained ........ in consequence of the non completion of the OW&WR’ . However in February 1852, the loop from the B&GR at Stoke Works through Worcester to rejoin the B&GR at Abbotswood was complete, traversing almost the same route as that that had been declared impossible by the B&GR back in 1835. The main line to Oxford and Wolverhampton followed in 1853 and by 1860, with connection to Hereford, Worcester’s rail network was in place. Countering the striking decline in glove making and the demise of nailmaking and malting, trades hit by mass production, the obvious additions are in foundries and railway related industry. However the locomotive and wagon works were not a success. The OW&WR had its workshops in Worcester but after amalgamation with the West Midland Railway and then the GWR, and a disastrous fire, they were removed to Swindon; if they had been established earlier than the 1850s they might have become more entrenched. Similarly the Worcester Engine works established in 1864 , later passing to the West Central Wagon works in 1872, failed, and its equipment was sold in 1876 – by this time there was a slump in demand and the firm was not well enough established to survive. Fortunately the signal works of McKenzie & Holland did succeed. So did William Blizzard Williamson who came from Wolverhampton and set up next to the canal at Lowesmoor around 1855 making milk churns, baths, domestic metalware and cash boxes, etc. 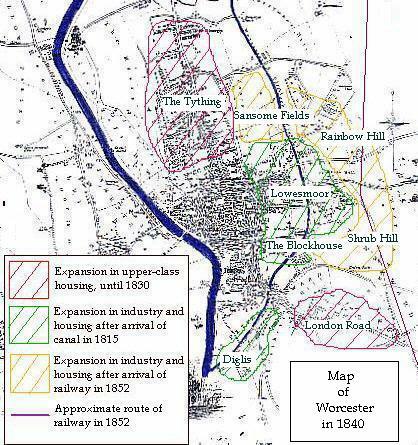 The map shows the main developments in Worcester from 1800 to 1860. Upper-class housing development began outside the traditional city boundaries after 1790, mainly in the north and along the London Road and had effectively ceased by the 1830s as Worcester’s cultural fortunes declined. It was not rekindled by the arrival of the railway. Working class housing began in the Blockhouse to the east of the city walls and this formed the nucleus of a new working class area, mostly built up by 1824. North towards St Martin and Lowesmoor, other working class communities grew up around the canal from 1815. Speculative back-to-back housing schemes were built and by 1830 Worcester had its main working class suburb in place. Large number of inns, commercial hotels, missions and music halls were built along with Non-conformist chapels in the canal-side area. The canal’s industrial centre on the east side of the city made it an obvious area to locate the railway centre and to this end, the OW&WR purchased 52 acres of land at Shrub Hill. The canal and the railway confirmed the working class and industrial character of the area and by the 1860s the remaining open spaces had been filled with a blend of housing and small industry. The arrival of the railway stimulated some new housing, particularly for its workers, in the Arboretum and Rainbow Hill areas, close to the railway works, along with welfare projects like the Railway Institute. The steady, but unhurried growth in both housing and industry points to a possible measure of control which Karen Pierson mentions, ‘that the bishops of Worcester with their legacy of social control – not to mention their actual control over countless hectares of land – would never have permitted the usurpation of their power that the Industrial Revolution would have caused within their realm’ (Pierson, p.48). This statement may be more relevant to the period up to 1825 when the city’s chief industry was glovemaking, an industry that was difficult to mechanise. Nevertheless Worcester had a strong upper-class base from its days as a cultural centre and it may have acted to curb the worst excesses of the industrialists. This situation is alluded to by Turberville in 1852; ‘It seems hard to say why Worcester, a city so centrally situated, and before the railway era, so advantageously situated as regards the means of communication with other parts of the kingdom, has not become a manufacturing emporium and a place of much greater importance. In my belief, one principal reason has been the hindrance to speculative or bona fide building, which exists in the bad tenure of land everywhere around the city; ........There has, moreover, been a lack of unity and co-operation amongst the inhabitants in the promotion of the general good ........ Considerations of the common weal have been postponed to the interests of partisanship’ (Turberville, p.18). Here is another factor which may have mediated the growth of industrialisation in Worcester. There is a trend in the population figures which indicate a sharp slowing in growth in the period from 1840 until 1850. This is not necessarily due to the absence of a railway and one possible reason is the slump in the glove trade of 22,000 jobs over fifteen years. The first graph shows the changes in population of Worcester relative to other Worcestershire towns (left-hand population scale) and to the county overall (right-hand population scale). The most obvious point of disparity is the relatively strong growth of places like Dudley and Stourbridge in Worcestershire’s Black Country (surrounded by coal and iron) and Bromsgrove which had an early railway connection and was home to the B&GR workshops. Towns without rail connection show decline, as in Kidderminster, heavily dependent on the carpet trade, or a marked slowing of growth, as in Worcester. The county as a whole reflects the overall increase in its industrial north-west. The second shows the changes within Worcester itself. As can be seen from the graph, although development in the inner city remained relatively static or declined, in the outer parishes, particularly in the east, population growth was fairly constant, apart for the dip in the 1840s. The third graph shows the growth of the two rivals on the Severn, Worcester and Gloucester; here the steady growth of Gloucester, which had rail connection in 1840 contrasts with that of Worcester. However Gloucester had a less industrial profile than Worcester and the railway produced no great spurt in growth. ‘There are not many short of 35000 souls here, the increase in the last decade having been unusually great, by the accession of manufacturers, workshops and railways’ (Noake, p.380). John Noake, commenting in 1868 felt that the railway had brought change. He also, somewhat obliquely admitted that he felt that it had lost ground in the past - ‘Worcester now seems bent on keeping pace with the times’ (Noake, p.380). Turberville, writing in 1852 felt the same; of railway communication ‘Worcester itself was, indeed, almost shut out from this advantage, now so indispensable to prosperity, till the half century had closed; but a brighter day appears now to be dawning upon us’ (Turberville, p.150). Were they right to feel this? Was Worcester’s fight for a railway worth the trouble and were the consequences of its delay as dire as they expected? In reality it seems that Worcester did not suffer the absence of a railway as much as its Council, Railway Committees or commentators imagined. Reasons for this are difficult to pin down but the continuing importance of the river must be a factor. River improvements continued so that it was the 1890s before trade began to decline substantially, long after the canals had been hit. Industry continued to grow, at a steady pace, perhaps mediated from behind the scenes by those resistant to change. The railway did encourage new industry, not always with success, but not in such a form as to overwhelm the city. Worcester maintained its stable, centuries-old position as a cathedral city in an agrarian landscape and a commercial and industrial base primarily geared to that landscape. John Noake, (1868), Noake’s Guide to Worcestershire, London, Longman & Co.